Our premiere H2No® Performance Standard hard-shell jacket, the waterproof/breathable Exosphere is constructed for alpine climbs or ski mountaineering in wet, cold conditions. The Exosphere provides durable 3-layer waterproof/breathable protection, with a Deluge® DWR (durable water repellent) finish, for extended use in big alpine arenas. 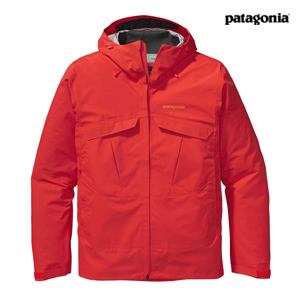 Its feature set includes coated watertight pit zips; a helmet-compatible, 2-way-adjustable hood; self-fabric hook-and-loop cuff closures; two horizontal chest pockets (with pressed pleats for increased storage), two handwarmer pockets that sit above the harness line and one internal storage pocket (all pockets close with zippers). A trim, minimal storm flap protects the center-front zip, and a dual-adjust drawcord hem seals in warmth.